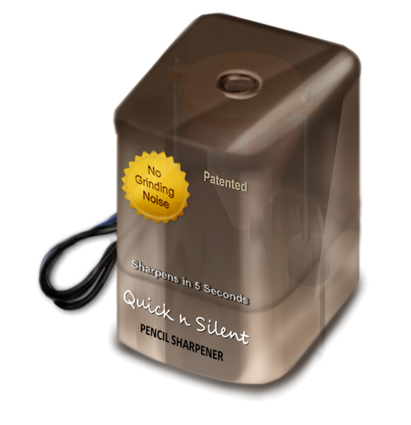 Quick n Silent Pencil Sharpener is a revolutionary new patented product that sharpens a pencil quickly in one cycle, silently without jamming. The pencil sharpeners available today grind the pencil to a point. This grinding noise is what feels annoying to most. The pencil sharpener products available on the market today do a fairly good job of sharpening pencils however, they are annoyingly noisy. Many competitive exams and schools ban the usage of pencil sharpeners during tests due to noise (manual crank-driven pencil sharpeners inherently pose similar problems as they share the cutting mechanism). 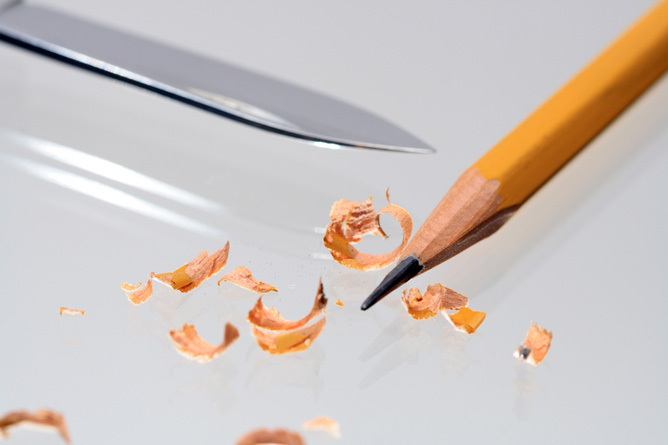 The noise comes from grinding the sharpener's metal blade against the pencil's wood body. The older the electric pencil sharpener gets, the louder and less effective it becomes, resulting in pencils that have to be reinserted a number of times to make the lead pointed. Possibly the most annoying side effect is when the pencil sharpener keeps sharpening the pencil so that the lead is exposed on only half of the side of the pencil while the other side of the pointed lead remains covered with material. The operator must continue to reinsert the pencil into the pencil sharpener in the hope that next time the lead may be fully exposed. This causes the pencil to become smaller and smaller each time. They are slow. Sometimes you have to repetitively push the pencil in to sharpen it. The pencil sharpeners have been around for over one hundred and fifty years. The first American electric pencil sharpener was patented in 1855 by Walter K. Foster of Bangor Maine. A lot of improvements have been made over the years but it seems that most, in not all designs, used grinding mechanism to remove the material off a pencil. One of the drawbacks to that is that the act of grinding a piece of wood with a metal blade is inherently noisy. After seeing my student's frustration with the pencil sharpeners, I decided to come up with a better solution. I noticed that ever since a wood pencil was invented, people all over the world have been sharpening it quickly and silently by hand, using a pocket knife. So I came up with the idea for a new kind of pencil sharpener. I call it the Quick and Silent pencil sharpener. I believe that my pencil sharpener would eliminate the two most annoying problems that were mentioned earlier. The Quick n Silent pencil sharpener is just that . . . Quick and Silent. It sharpens the pencil in less than 5 seconds and in one pass. The Quick n Silent pencil sharpener uses the same proven method of sharpening a pencil with a pocket knife as its basic design. 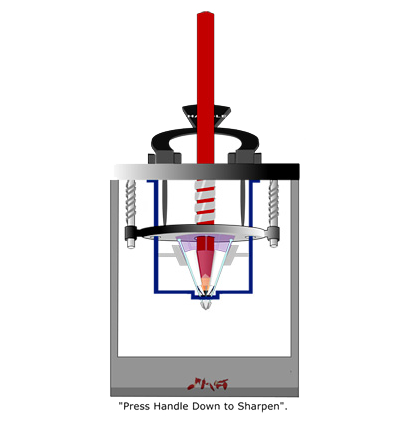 The patented cutting mechanism consists of six tiny blades that surround a pencil inside a sharpener and when activated, quickly and silently shave the material off a pencil. The result is that a pencil gets sharpened perfectly in one pass. All that is needed is to insert the pencil into the Quick n Silent pencil sharpener and press a lever down. This single action completely sharpens a pencil, and it is ready to be pulled out of the pencil sharpener and put to use. How does a Quick n Silent pencil sharpener differ from pencil sharpeners available today in the market? This new pencil sharpener sharpens a pencil quickly and silently using a unique design, as opposed to regular pencil sharpeners that are noisy and take a while to sharpen. The Quick n Silent pencil sharpener would have huge potential. Besides schools, offices, businesses and home use, U.S. military could be a potential market. Has a U.S. patent obtained for this new technology? Do you have other patents pending? Yes. One other related patent is pending that will reflect variations and improvements to the earlier design. What other steps have you taken using your own resources? One patent has been obtained. Another patent is pending. I have obtained two domain names (Quick and Silent and Quick n Silent). An initial website has been made. A short animation depicting the cutting process of the Quick n Silent pencil sharpener has been made. This flash animation would help during the prototype phase by visually showing the steps required. It also helps explain the process to the layman. Is Quick n Silent pencil sharpener available in the market today? I am in the process of obtaining funding to bring it to the market. How would the funding be spent? All of the funding would be used in the making of this pencil sharpener. The website would list all the donor names and the amounts donated. Status updates would be posted regularly with clear accounting of the funding. The first step is to have a functional prototype made that would cement the design. The second step is to go into limited production. Are there any safety issued with kids using this product? The six tiny blades would be embedded deep into the plastic housing and not accessible without opening. The electric model would also be UL listed. What if the functional prototype proves that the design is not practical? After all is said and done, we are talking about a few sharp blades shaving a wooden pencil. The design may need a few tweaking, but ultimately everything would work. When is the Quick n Silent pencil sharpener expected to be available in stores, after funding is received? If the funding is made available, it would take from three to four months to have a market-ready product completed and a few hundred samples made. What if the funding does not materialize? The project would be shelved until I can save enough or find some investor or company that would bring this product to market.